In this post, we feature a comprehensive Linux tar Examples. I am a real fan of learning Linux commands by examples and from my personal experience it will really help to see some Linux tar command examples. But first, a brief bit of background information. The name “tar” stands for “tape archive”. As that name implies, originally it was a command that Unix administrators used to deal with tape drives. Where we now use the Linux tar command to create a tar file, we used to tell it to write the tar archive to a device file (e.g in /dev). Nowadays the Linux tar command is more often used to create compressed archives that can easily be moved around, from one disk to anther disk or machine to machine, in other words we can call it as backup utility and its been used in most of the Unix flavors. One user may archive a large collection of files, and another user may extract those files, with both of them using the tar command. 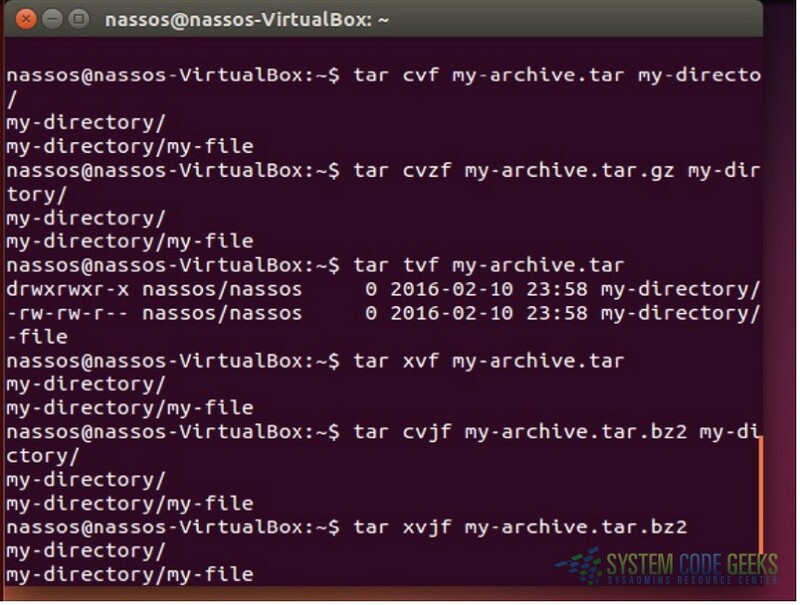 In this example we will come to know basic tar command using option ‘cvf’ to create a tar archive. In order to make tar ball as zipped archive , we need to use the option “z”. In below example the command will make “my-archive.tar.gz” for a directory “/home/my-directory” in current working directory. In order to extract the contents of a *.tar.bz2 file the options are “xj”. 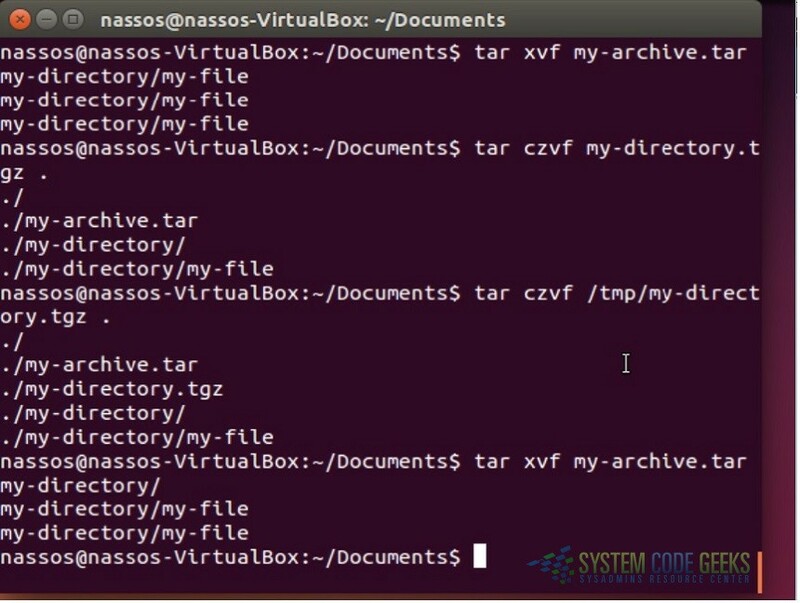 To extract a specific file from a tar archive, specify the file name at the end of the tar xvf command as shown below. The following command extracts only a specific file (my-file.sh) in the current directory from a large tar file. [root@chasiota /]# tar czvf my-directory.tgz . In the above example, the ‘.’ at the end of the command is how you refer to the current directory. [root@chasiota /]# tar czvf /tmp/my-directory.tgz . If an output line starts with Verify, and there is no differs line then the file/directory is OK. If not, you should investigate the issue. Note: for a compressed archive file ( *.tar.gz, *.tar.bz2 ) you cannot do the verification. Finding the difference between an archive and file system can be done even for a compressed archive. It also shows the same output as above excluding the lines with Verify. 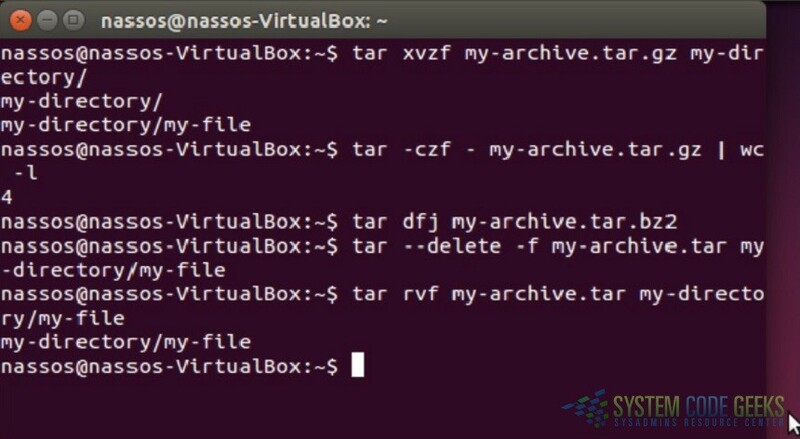 [root@chasiota /]# tar -xvf my-archive.tar "my-file-1" "my-file-2" "my-file-3"
[root@chasiota /]# tar -zxvf my-archive.tar.gz "my-file-1" "my-file-2" "my-file-3"
[root@chasiota /]# tar -jxvf my-archive.tar.bz2 "my-file-1" "my-file-2" "my-file-3"
The p option preserves permissions; file protection information will be remembered. Use tar to move files…. hey,nice examples of tar command.i am bookmarking it.